The 52D254M directional gyro is a square 3-inch (ATI-3 ARINC) instrument. 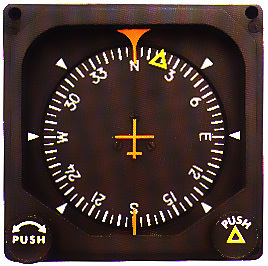 The vertical compass card provides basic heading information when the aircraft is flown manually, as well as an autopilot heading selected. The instrument features a heading bug, color-coded aircraft and top-bottom indices, and is internally lighted.